Whether you’re serving 10 people or 100, DiGregorio’s wants to be a part of your party. Your guests will love it and so will your budget. We make it easy to order catering for your corporate office, family picnics, holiday parties, graduations or just a small get together. At DiGregorio’s we offer authentic Italian food catered for any number of people and for any occasion to ease your burden. Call us today to place your order for your next party! Whether you’re looking for an easy appetizer or a full meal, an Italian antipasto platter is an ideal solution. It’s simple and delicious, with no work required! This traditional arrangement of Italian meats, cheeses, olive mixes and our original house made Olive Salad makes an ideal choice for entertaining. It can be a delicious easy appetizer or a perfectly satisfying meal to enjoy with a good glass of wine and great friends. What’s better than freshly sliced deli meats and cheeses? A platter full of them. Whether you’re looking for an easy appetizer or a full meal, a DiGregorio’s Deli Tray is an ideal solution. It’s simple and delicious, with minimal work required! This arrangement of gourmet meats and cheeses allows guests to create their own sandwich and makes an ideal choice for entertaining. Whether it’s a celebration or a business meeting, this tray is a perfectly satisfying meal to enjoy with a co-workers and friends. Take some of the guesswork and stress out of party planning with a delicious crowd-pleasing party sandwich. It’s simple and delicious, with no work required! Sandwiches can dawn the shape of numbers for birthday or anniversaries, can come in foot increments up to 6 foot, or can be cut and placed onto a tray making it an ideal choice for easy entertaining. Whether it’s a celebration or a business meeting, a DiGregorio’s sandwich is a perfectly satisfying meal to enjoy with a co-workers and friends. This authentic Sicilian sandwich is sure to impress. Thinly sliced Italian meats such as prosciutto, hot or mild coppa, capocolla, mortadella and salami with provolone and our original muffuletta spread stacked on fresh, seeded Italian Muffuletta bread. 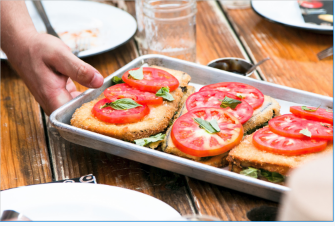 This traditional Sicilian sandwich is a delight and an ideal choice for easy entertaining. Whether it’s a celebration or a business meeting, a DiGregorio’s Muffuletta sandwich is a perfectly satisfying meal to enjoy with a co-workers and friends. Fresh green salad with artichokes, black olives, pimentos, Provel cheese and more. This fresh green salad will perfectly compliment as a side to party sandwiches and deli trays. A colorful pasta salad with a zesty Italian twist. This crowd-pleasing pasta salad is a great go-to summer side dish for any occasion. This ready- to- eat salad makes a colorful and easy choice for entertaining. Whether it’s a celebration or a business meeting, this pasta salad is a perfectly satisfying side to go with your meal. Our twist on a classic staple. This Italian Potato Salad is mixed with sweet vinaigrette dressing for a lighter taste. New potatoes mixed with green beans, garbanzo beans and onions give this potato salad a unique taste guests will enjoy. This ready-to-eat salad is an easy choice for entertaining. Whether it’s a celebration or a business meeting, this potato salad is a perfectly satisfying side to go with your meal. Bring back all the memories of Sunday dinner with this great tasting, well done Roast Beef and experience exceptional seasoning in every bite. Tender and flavorful with natural juices locked in; our roast beef comes with sautéed onions in a mushroom wine sauce. The same family recipe we’ve been making for over 45 years. Our homemade Italian meatballs are baked in a marinara sauce and covered with fresh grated parmesan cheese. Our house specialty, made fresh daily with tomatoes, cheese, whole fennel and Italian spices. Using the same recipe and process for over 47 years, our all-pork hand-tied artisan Salsiccia has withstood the test of time. Sausage is sautéed with green peppers and onions in a crushed tomato and basil sauce. Offered sweet and hot. An Italian favorite! Cooked shell pasta prepared with our homemade rich creamy Alfredo sauce with fresh broccoli and mushrooms. Our family style Pasta Con Broccoli can be ordered warm or ready to heat and serve. Take some of the guesswork and stress out of party planning with a delicious crowd-pleasing pasta pan. Penne pasta (mostaccioli) cooked in a homemade meat sauce with freshly grated parmesan cheese. It’s simple and delicious, with no work required! Perfect for any celebration or business meeting. An Italian classic! Layers of sheet pasta, homemade marinara sauce with fresh ricotta cheese and our original Salsiccia. It’s simple and delicious, with no work required! Perfect for any celebration or business meeting. A meatless version of the Italian classic! Layers of sheet pasta, homemade marinara sauce with fresh ricotta cheese and spinach. It’s simple and delicious, with no work required! Perfect for any celebration or business meeting. Meat tortellini, prosciutto, peas, mushrooms and our rich, creamy Alfredo sauce; topped with fresh Parmesan. It’s simple and delicious, with no work required! Perfect for any celebration or business meeting. Cylindrical type of pasta, Cannelloni is always a sign of a festive occasion in Italy. Stuffed with meat in our homemade marinara sauce with shredded cheeses, topped with grated parmesan. It’s simple and delicious, with no work required! Perfect for any celebration or business meeting.